Corrufoam is an EPS system which is cut to fit the profile of corrugated roof sheeting either ’corrugated iron’ or Big 6 fibre cement sheets. Corrufoam is glued to the roof sheeting with a special adhesive and then painted with a thin film EPS plaster or paint. The product provides a flat under side ceiling to the sheeting. 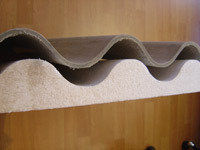 Dependant on the thermal insulation required and budgetary constraints Corrufoam is supplied in a range of thicknesses.